Who does a sales rep speak with first when a demo request comes in? Who often joins the meeting to see a demo of your product? If someone wants to buy, do they need permission from someone else? If you go to your customer’s office, who will be interacting with your product? Once you have made a list of people who interact with your product or sales process in some way, think about how you can assign them to a category according to job title or role. My team sells to gym operators. 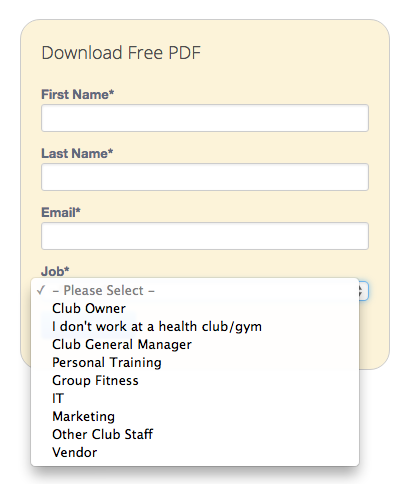 Our personas include the gym’s general manager, front desk staff, personal trainers, class instructors, etc. There are many people who interact with our product in different ways. What are the most difficult parts of their job? What are their outside interests? Who do they interact with the most? What characteristics are typical of their personality? What metrics are used to measure their success? What publications do they read and what events do they attend? You should outline every aspect of this persona. Doing so will help you craft marketing that is most likely to resonate with them. Every company has a different number of personas, although it’s most common to have 3-10 of them. When personas are defined, you can segment your marketing to appeal to different types of leads. For example, if you are sending an email campaign, you might write 3 different versions of the email copy, each applying to a different persona. This increases the probability that each will open and click. When personas are defined, you can more easily understand your contact database and see if you are engaging with the most impactful people. For example, if you find that the majority of the leads in your database are not the decision maker’s persona, you need to tweak your marketing messages and channels to better appeal to the most valuable leads. When personas are defined, you can ensure that contacts do not receive marketing messages that are irrelevant to them. For example, if my team creates content targeted at how personal trainers would use our product, but we send it to the front desk staff in a gym, those leads will be much less likely to engage. Furthermore, sending contacts content that is not relevant to them degrades the trust you build with inbound marketing. The goal is to only send the most relevant content so contacts are most likely to open your emails and convert on your landing pages. Finally, when personas are defined, you can use your marketing automation system to display different website copy or graphics to different personas. Remember that this is done via closed loop marketing since you stored a cookie on the lead’s computers and thus can track their activity on your website and with your content.